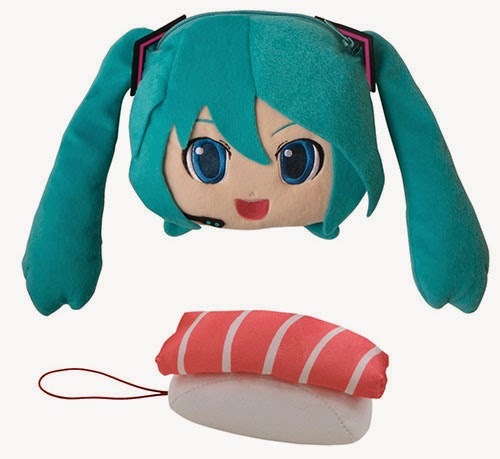 What business does a guy like me, a guy who doesn't own a single Hatsune Miku game (although I'll have two shortly), have desiring something as fan-focused as the "deluxe plush pouch" showcased in the photo below? I don't know. All I know is that I think it's fantastically adorable and that I want one--despite the fact that my life currently is one, big "Hatsune Miku-free zone." To be honest, though, I have a feeling I'll chicken out on buying one when all is said and done. After all, the darn things are going to cost about $35, if not more, and that's before shipping is included. Still, it comes with the most precious little sushi-themed screen cleaner (also pictured above), and that alone has to be worth about $10 or $15, right? Haha, I have similar problems... :D But with all things cute, like wadadon or rilakkuma-themed stuff. The shipping is usually most of the cost for us in Europe. I did buy a super cute, handmade Kirby 3DS XL pouch from Etsy though! Yeah, you and I definitely are in the same boat, Linnea. I'm weak for all things cute. Oh, well, there could be worse things in life, right? That's probably not a bad idea for the time being, Franggio. Anyway, I'll do my best to put some time into this sucker soon and then report back here what I think of it. Good luck with it tho! Geez, that PSP cost about that much, WITH shipping. Oh, I wouldn't get this to "collect" it, Jess. I'm also not really into that. (Games? Yes. Game-related merch? No.) I'd get this to USE it. That said, it's very unlikely I'll get it or use it, as I don't really need another case for my 3DSes.